5 bedrooms plus den, sleeps 12, all-suite w/private balcony & bath, Spectacular! Spectacular ultra-luxury villa on St. John's coveted North Shore. Located in exclusive Peter Bay Estates, walk to your own private estate beach. With over 13,000 square feet of living area, breathtaking views from every room and every amenity the savvy traveller wants, this is the Villa for you! A short ferry ride from St. Thomas, you will be greeted by our island manager to whisk you and your party the short, 3 mile drive to Villa Delfina. Take a dip in the infinity-edge pool, sip a cool beverage from the pool bar or lounge in the spectacular setting of the veranda, wherever you are in this gorgeous villa, you're only a glance from the drop-dead beauty of the Caribbean...Villa Delfina was built with the luxury renter in mind; from the incredible Game Room with pool table and island-stone/shell bar, to the Media Room's 50-inch flat panel TV, to the spectacular furnishings, you will have the vacation of your life at Villa Delfina. Designed for families or an intimate getaway! Twice-weekly maid service, more frequent on request. Chef services, massage and many other services available on request. My family stayed at Villa Delfina during Spring Break 2009, with two other families (total 12 people), and absolutely LOVED it! The home is GORGEOUS ... spacious, luxurious, clean, well-stocked, and features the most most beautiful views we've ever seen! The beds are really comfortable, and we found the house to be a perfect place to rent with other families, because we all had our own rooms with private veranda, coffee maker, mini frig, etc., so we could see one another as often or as little as we wished. We had a great time hiking, scuba diving, snorkeling and visiting the beaches that made St. John famous! Our kids loved Villa Delfina, because they could walk down a path to the private beach or enjoy the pool and hot tub at the house. At night, they had lots of movies, books and games to choose from, including pool, pinball, darts, xbox, etc. It was a perfect vacation, and we would recommend Villa Delfina to anyone! Our family stayed at Villa Delfina over Spring Break 2009, with two other families and absolutely LOVED it! I can't say enough good things about it: It is simply GORGEOUS ... spacious, luxurious, incredibly clean, well-stocked with everything you might need, and the beds were really comfortable! Best of all, the house boasts the most beautiful views in all of St. John! Our kids were in Heaven ... they could walk down the path to a private beach, or enjoy the pool and hot tub at Villa Delfina. At night, they had lots of movies, books and games to choose from, including pool, pinball, darts, xbox, etc. We also enjoyed hiking, scuba diving, snorkeling and visiting some of the beaches St. John is famous for. A day spent diving on the wreck of the Rhone was a real highlight! In short, Villa Delfina is a fabulous vacation destination, and we would recommend it to anyone! Vacationing during any school holiday is tough. but while on the island of St John and at the fabulous Villa Delfina we felt like we were able to relax and enjoy without any of the hassles. The house was even better than any of the pictures or reviews could describe. Every detail was thought of and then some. the weather was magnificent, no air conditioning was needed. We slept with the doors and windows open and the fan on. The out door showers were a real treat, we even had a lizard come by and he told us how much he liked the outdoor shower as well. We stayed at this spectacular villa to celebrate my husband's 40th birthday. It is such a special place to share with our family and friends. The house is so spacious and luxurious with unbelievable views from every room. We spent two of the days enjoying the beautiful water on a boat, swimming and snorkling and visiting some of the other islands. We also spent a few days at the house relaxing by the pool and utilizing the wonderful, theater and game room/bar. The bedroom suite were each so wonderfully decorated and everyone loved the outdoor showers! The local restaurants were great as was the cateres we used. We are looking forward to returning soon!! 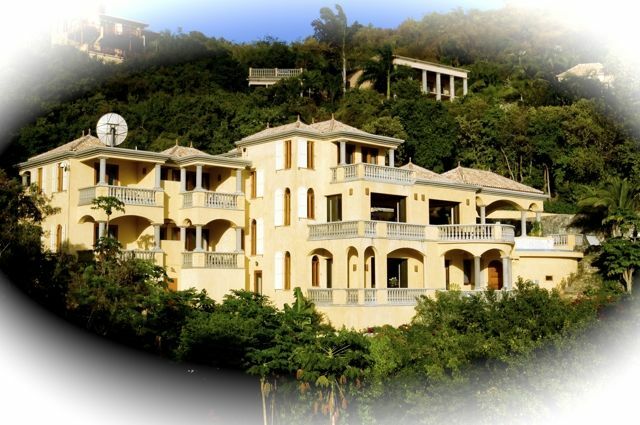 Located on St. John's North Shore and surrounded by the VI National Park within the exclusive, private, gated community of Peter Bay Estates. A private beach is a 5-minute walk from Villa Delfina. Cruz Bay, St. John's main town with shopping and the St. Thomas ferry is an 8-minute drive away. This prime location is situated between St. John's two most beautiful beaches, Trunk and Cinnamon. Both are a 2 minute drive from your villa. Quick access to the North Shore Road to take you into Cruz Bay, or to the East End and Coral Bay. The North Shore is pristine and peaceful, but a short drive to downtown Cruz Bay. Hear the waves crash at night from Villa Delfina and let the tropic breezes lull you to a peaceful sleep.